Featuring a sunflower painted on a wooden plate with a 4 1/4" center diameter. 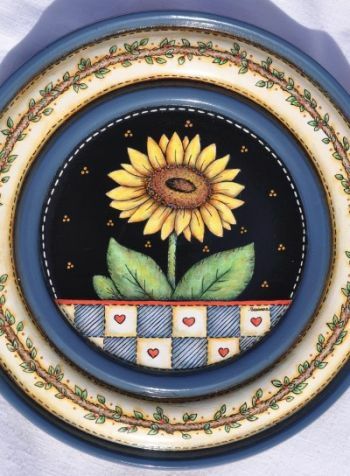 The sunflower is like the little logo on my website but it is painted on a plate with a black background and is surrounded by a twig and vine around the rim. The directions also are given for a sky blue background and this pattern may be resized to fit other surfaces. This e-packet contains: Complete directions, one color photo and one full size pattern page for a total of 4 pages.